If you know me, then you know that I have a bit of a soft spot for styled shoots. And when it comes to stylists, Michelle Leo Events is definitely at the top of my list! She and her dream team created this romantic beach inspired look and the second I laid eyes on it, I just knew I had to share! Captured by the amazingly talented Terra Cooper Photography this beach inspired styling has me dreaming of an ocean escape! From the Designer, "I've had several brides come to me telling me they really like the idea of a beach-like feel for their wedding, but many feel like they can't (or shouldn't) have a wedding in this style being that they don't live on or near the ocean. A lot of my brides feel like they should have a "rustic" type of wedding being that they live in the middle of the Rocky Mountains. I've even had two different brides ask me "Is it dumb to have a beach-styled wedding even though I live in Utah?" Drawn to this beach inspired look, but don't think it works since you're aren't saying 'I do' on the coast? Well, get excited because Michelle Leo Events has done it again! She and her team put together this inspiration shoot to show brides that they truly can have a beach style wedding even if they don't live near the water! Get ready for a whole lot of seaside inspired goodness! More from the Designer, "The color palette for this wedding was inspired by some of my all-time favorite shades. I’m such a fan of soft blues and watery greens. Having spent a lot of time on the Outer Banks of North Carolina, I fell in love with the soft landscape and wanted to make sure I selected shades for this project that reminded me of this beautiful coast line. That being said, I didn’t want everything to be too soft so I punched things up a bit with a vibrant cranberry shade to give these soft hues a little pop. Summer is full of vibrant floral colors and I felt confident that I could marry the softer tones with the vibrant tones in a way that still felt bridal-appropriate." Other favorite elements of mine include the simplicity of the plate setting. I adore the basic greenish-blue plates. They’re chunky and substantial and I think they help complete the look of the table setting adorned in shells, beautiful sea-glass colored bottles and mercury glass. And the “paper” suite? It's actually made of wood and stained to look like old, sun-faded driftwood that you might find lying on a beach somewhere. These wood pieces were the perfect addition to this tablescape. And those beach-inspired cakes?! I think it's safe to say that Cake-a-licious totally nailed Michelle's vision. Utter perfection! And definitely the sort of inspiration that just goes to show that you can dream outside the box! Lots of love goes out to all of the talented wedding pros who made this one come to life! 13 Comments " Romantic Beach Wedding Inspiration: Michelle Leo Events "
Vibrant tones with more subtle ones always go perfect on a classic-style wedding. I love a more light-colored palette for special occasions. Great pics! 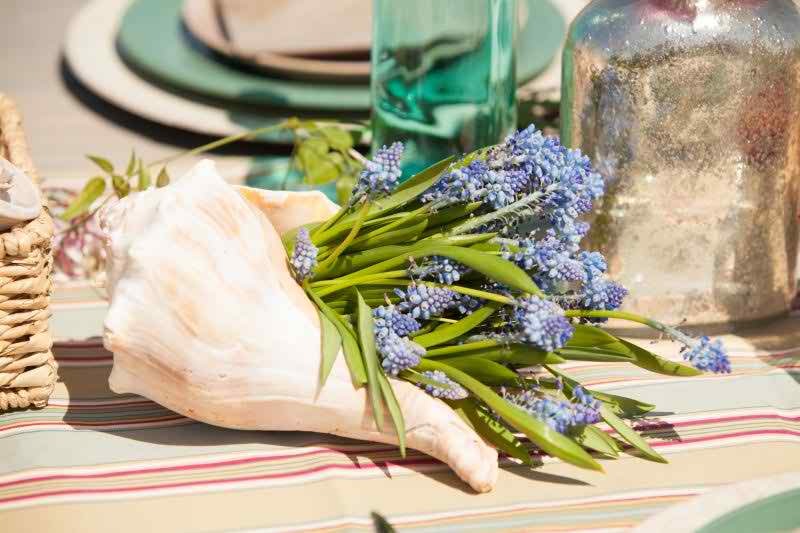 Check out some great accessories for an unforgettable summer wedding. Absolutely gorgeous! The "sandy" texture on the cakes is brilliant! These color palette is divine and I am crushing on that cake! Gorgeous! The paper suite is my fave!! So gorgeous - great inspiration! What an awesome, colourful shoot! Adore it! I love the colors! So often I just think of blue for the beach, but this styling is making me rethink that - so fantastic with all the bright shades! Absolutely stunning! This wedding is stylish and timeless all rolled into one! The Great Concept :) Michelle! Loved your style! Love this inspiration. That paper suite is amazing! you so much for sharing it with us.